Kindergarten sets the foundation for a lifetime of learning. At MCDS, there is a distinct focus on learning how to learn and developing critical and creative thinking skills to solve tomorrow’s problems. Children at this age already have a natural enthusiasm for learning. At MCDS this intrinsic curiosity is nurtured, while individual strengths are appreciated and encouraged. Kindergarteners embark on an exciting journey that ends with being able to read, write clear sentences, and problem solve on their own. At the same time, young students develop creativity in art, music, science, and daily free play. They explore world cultures and learn Spanish. Kindergarteners make friends and learn to work together. They thrive from personalized attention from experienced, dedicated teachers and finish the year as engaged thinkers, ready to soar! 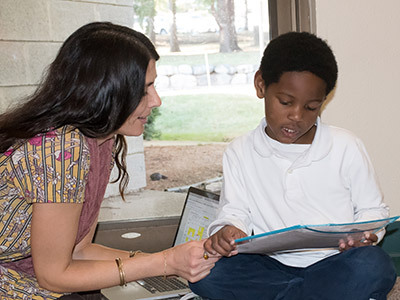 Students develop a solid mastery of the 63 phonograms of the English language as the basis for learning spelling, reading, writing, and penmanship. Daily Reading and Writing Workshops offer group time and individualized support. Writing Workshop starts immediately with students beginning to apply the 6 + 1 Traits® Writing skills as they learn them. Students share ideas and practice public speaking skills in class, with book buddies, and in front of a larger audience during all-school assemblies. Literary experiences place emphasis on listening to, understanding, and appreciating quality literature of all kinds, including poetry, rhymes, fables, chapter books, and plays. Weekly Language Art Centers with teachers and parent volunteers offer the opportunity to review and celebrate the week of learning. Kindergarteners begin the Singapore Math curriculum, a world-recognized and acclaimed program emphasizing a deeper understanding of math skills. Students learn math concepts from counting, ordinal numbers, numerical sequences and patterns, place value, shapes, graphing, sorting and classifying, to addition and subtraction, simple fractions, measurement, estimation, and money value. Students investigate all seven continents, developing an appreciation for the similarities and differences in cultures. Each continent is celebrated in a unique way from a Mexican Market Day to African animal reports. Holidays, religions, and historical figures from around the world are studied including Native Americans and Pilgrims, past and current presidents, Gandhi, and Martin Luther King Jr.
Students conduct hands-on experiments to learn the scientific method. They explore soils and decomposition by preparing and tending a worm compost. They investigate weather phenomena through experiments with cloud formation, ice melting, and the force of wind. They study the planets of the solar system and learn about constructions by examining different building materials to compare strength, flexibility, and balance. Students learn basic musical concepts through singing, playing instruments, moving to music, and listening to different performers and composers. Musical note reading is introduced to prepare for piano lessons that begin in first grade. Creativity flows in Art, where students delve into projects with every medium from drawing, to painting, to collage, to clay, to weaving, to sculpture. Students learn over 300 Spanish words through games, songs, books, and art activities. Topics include numbers 1–100, greetings, colors, classroom words, animals, days of the week, months, food, weather, parts of the body, and simple questions. Latin American culture is explored and celebrated. Kindergarteners experience the joy of physical movement as they build on gross motor skills including balance, space awareness, and coordination. Team sports are introduced. Recess time is carefree with ample space to run and climb on the nature-inspired playground. Sledding is a favorite in winter! Prepare the student for the formal study of mathematics, science, history and geography, foreign language, art, and physical education.